Since the enterprise’s inception, technology has been paving the way for business innovation. Cognitive computing, along with constituent technologies, seems to be yet another promising catalyst for enterprise transformation. These technologies bring along the potential for high-level automation. They are poised to improve productivity across multiple functions. The evolution of cognitive automation is due to an emergence of various interdependent streams of Artificial Intelligence (AI). Natural Language Processing (NLP) is one of the key components of cognitive automation that can be applied to a variety of industry segments to address their pain points. It may be used to uncover relevant insight from a chain of email communication. Or, it may be employed to enhance customer experience by allowing users to post queries in their own language about products, services, or applications and receive immediate and accurate answers. Based on AI algorithms and driven by an increased need to manage unstructured enterprise information, NLP is influencing a rapid acceptance of more intelligent solutions in various business domains. In this post, I share my experience of how NLP based solutions can be leveraged to increase the efficiency and quality of ticket management systems. Cognitive systems attempt to simulate functioning of human brain, imitating the way we learn from past experiences and use that knowledge for reasoning, making hypotheses, inferring, solving problems, or making decisions. Combined with automation, enterprises can leverage these systems to automate judgment-based activities involved in a business process. In this way, they can augment human expertise so that we can maximize the use of our time. Natural language processing is one of the main abilities of a cognitive computing system. Its goal is to process the language we use and transform the text into structured data. It enables people and machines to interact more naturally with one another and can even expand human expertise. Over time, the NLP-based systems may learn how to provide expert assistance to scientists, engineers, lawyers, and other professionals to complete a task in a fraction of a time that a human might require. Analyzing textual data is a complex and resource-intensive task. A huge amount of information is hidden within textual data repositories under the guise of emails, documents, chats or may exist in the textual data of a business. Going the extra mile can provide organizations with valuable insight for developing business strategies. If used correctly, these technologies can simplify and accelerate many business processes and pave the way for business innovations and increased agility. Natural language processing can be applied in a variety of industry segments—media, publishing, advertising, healthcare, banking, and insurance—to improve key activities. It can be used to monitor social media, which helps a company know what their clients are discussing on social media and could reveal relevant information for their business. Another application could be a question-answering tool that could reduce effort of many of administrative jobs. Trouble ticketing systems are one such application that deals with large amounts of textual data. When we talked to the team handling a trouble ticketing system, we learned that in order to complete their day-to-day activities, they spent a huge amount of time and effort to manually analyze the textual data. To solve this problem, we worked with the team to identify some of the key business processes that necessitated a high level of manual work to analyze the data. After assessing the business need, we discovered that NLP techniques were a good way to solve the problem. By applying NLP techniques, many of the manual activities could be automated and thereby reduce the time and effort needed to complete a task. Automated Query Response: we found that one of the major pain points was isolating the right response when a particular query was raised. The team wanted to leverage the knowledge base, which is built from the previous queries and responses. Here, the main objective was to reduce dependency on memory recall. Such an option was not available in the current system. As a solution, we used some text analytics techniques to find similar queries based on word frequency. Apart from the standard keyword-based searches, we also used various data correlations to bolster the response set. 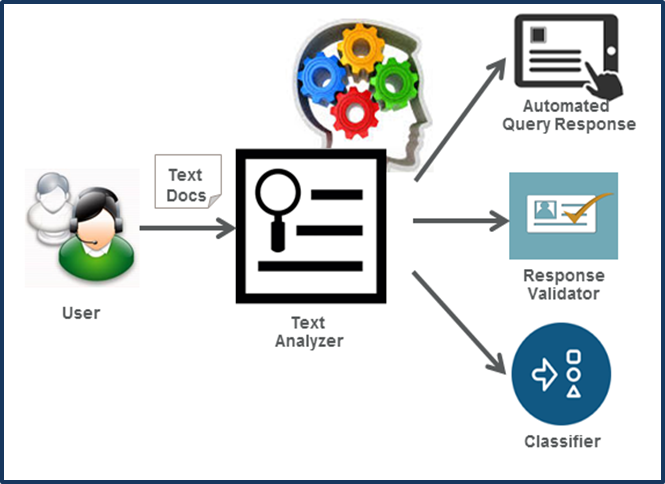 Content Based Response Validation: Quite often, a query’s response does not contain adequate content information, which makes creating an evolving knowledge repository a challenge. The inadequacy of text cannot be checked with standard validation techniques. In our solution, we leveraged NLP techniques to verify the adequacy of the content. Automated Ticket Classification: Frequently, queries in a ticketing system are not classified appropriately. Improper classification leads to an increase in resolution time. As manual classification involves a huge amount of time and effort, we combined machine-learning techniques with NLP to automate and accelerate the ticket classification process. The NLP based automated Trouble Ticketing System enables user to reduce the effort and time required for processing unstructured textual documents.